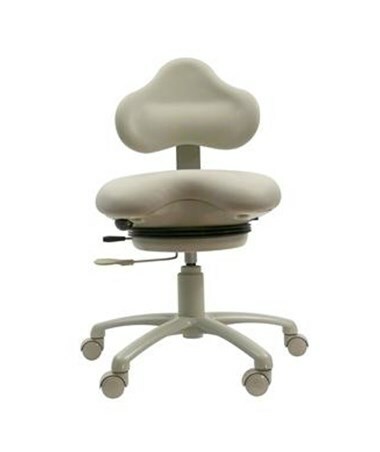 Brewer's DynaCore 9400 Series Dental Stool is the ultimate in therapeutic seating, focusing on both prevention and rehabilitation of lower back pain. Its "floating" seat design leads your body to assume its natural posture automatically, strengthening your core muscles while you work. 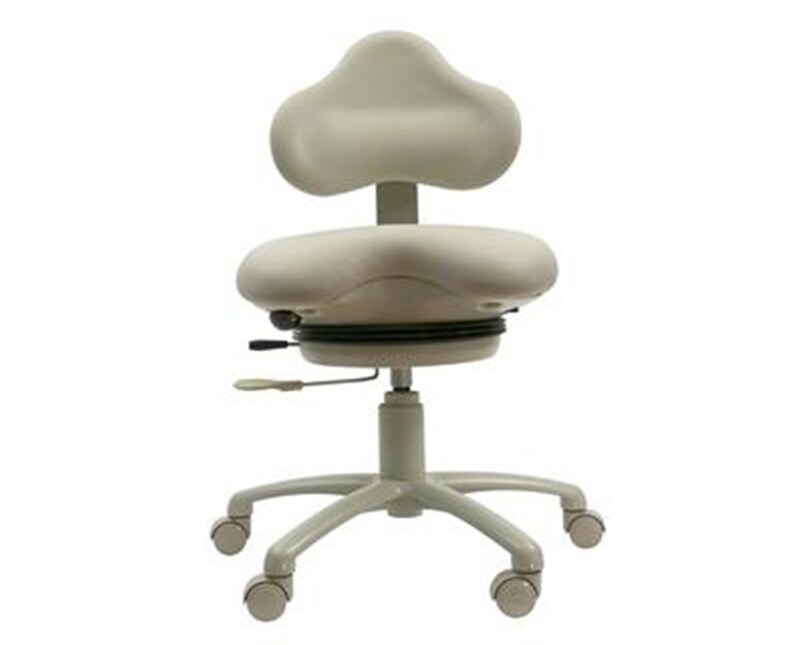 A variety of other features make this the seating system for dentists concerned with chronic back pain and fatigue. Normally, poor working posture restricts core movement, causing atrophy of the inner core muscles; this leads the body to overcompensate via the larger muscles of the back. The Therapeutic Dynamic Seating System at the heart of the Dynacore 9400 Series generates a safe, progressive method of activating and excercising your core muscles while using the stool. The Air Pump & Release Valve adjusts the air pressure of the system, allowing you to control the tension in the movement of the seat. The Air Pressure Gauge displays the amount of air in the system. The Air Shut Off Valve maintains the consistency in the system by locking it down when needed. The Activation Lever engages or disengages side-to-side movement. The 9400 Series isn't limited to back health. Through its accurate movement of deep inner layer core muscles, this seating system increases sensory feedback to the brain. As a result, your ability to focus is enhanced, as is your productivity and concentration levels. This also promotes postural health and endurance. Pneumatic height adjustment of either 17" - 19.75", 19" - 23.5" or 20" - 24.75" makes it easy to find the most comfortable seating position. A 21.5" powder-coated cast aluminum base equipped with polyurethane tread casters provides stability and smooth, reliable movement. The stool has a weight capacity of 250 lbs. All Brewer products conform to US and Canadian electrical and medical industry codes and regulations, and come with a 5-year warranty. We offer Brewer's DynaCore 9400 Series Dental Stool in three height ranges and two upholstery styles. The upholstery comes in a wide range of colors - view the color chart and specify the color you would like in the "Special Note" section during checkout. Select from the other options available in the drop down menu above and order online direct by clicking "add to cart!" Seat Height Range 17" - 19.75", 19" - 23.25" or 20" - 24.75"
Brewer Dental Products are Custom Designed Furniture which cannot be returned. We take the responsibility to make sure this product arrives in brand new working condition. Should your item arrive damaged, we will replace the product at no cost to you. Cancellation: Orders cannot be canceled or modified after one (1) business day following order confirmation. Cancellations will be subject to fees of up to 25% of sell price.